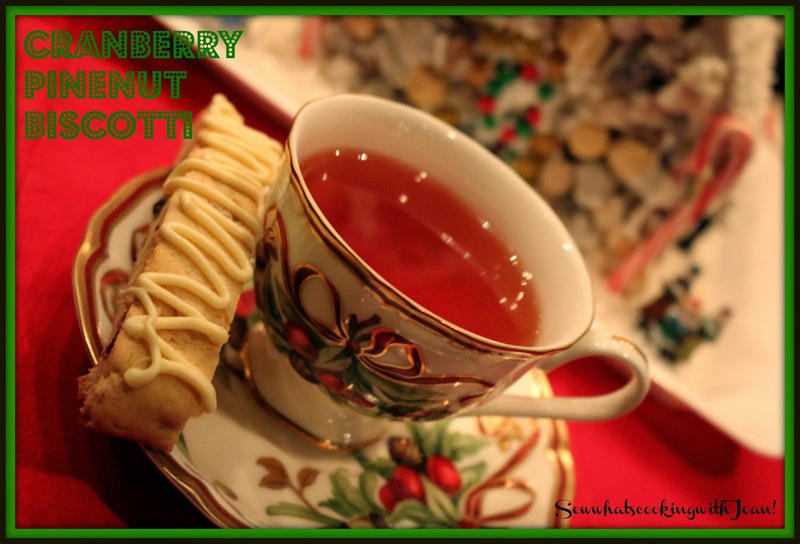 I love to have a biscotti with my tea in the afternoon or even first thing in the morning. 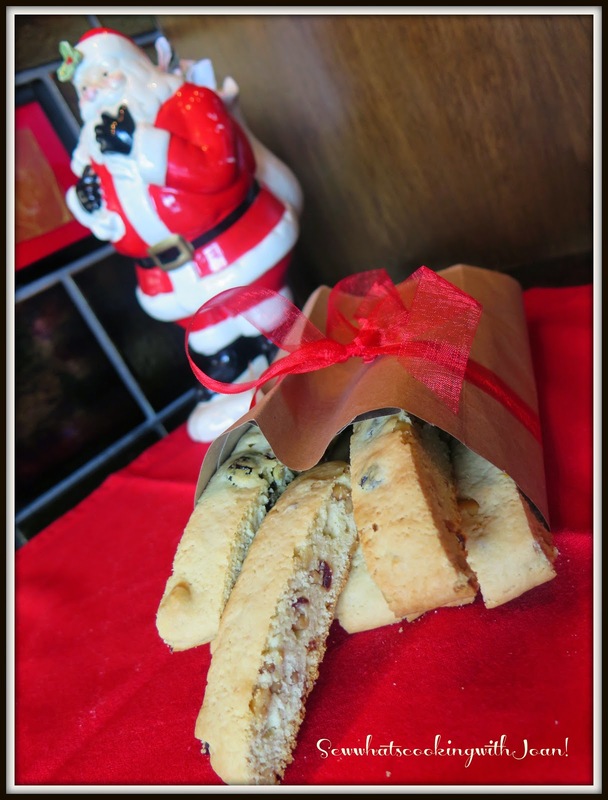 Also, one of my favorite cookies to send to a few special people in my life is biscotti .....just a little bit of JJ in a neat little package tied with a red bow! When it arrives, it is intact, no breakage, perfect for shipping! One of the things I like most about this cookie is, it works well with lots of different flavors. You can change out the nuts or the cranberries for pistachios, pecans, almonds, craisons or currents. 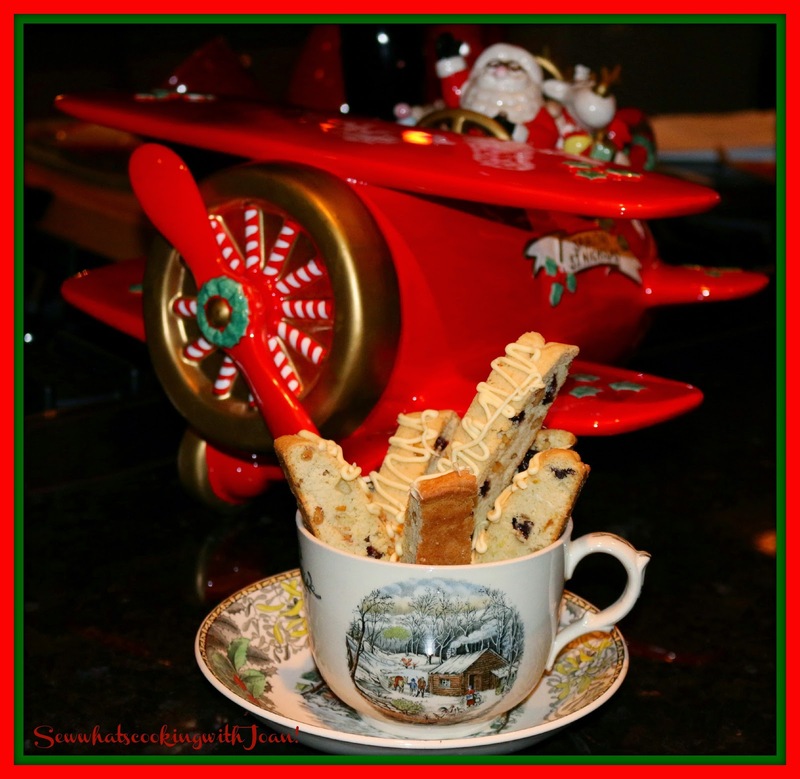 But, I am crazy about white chocolate and cranberries together in this recipe, yum! The color is perfect for Christmas, red and white, like a little mound covered a light dusting of snow! This time I added in some toasted pine nuts, they add to the depth of this biscotti. Imagine Christmas morning, sitting with your morning beverage, watching gifts being opened and enjoying this festive cookie....perfection! 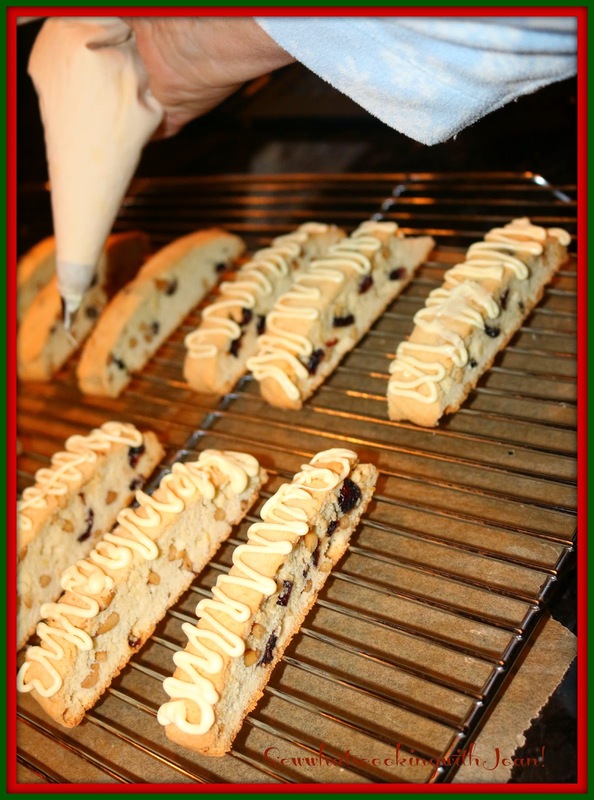 Biscotti is so quick and easy to make! It also keeps really well in an airtight ziploc bag too, so you can enjoy one every morning! Toast the pine nuts in oven for 5-7 minutes. Watch closely as they burn easily. In a bowl, beat the butter and sugar until light and fluffy. Beat in the eggs, lemon juice and zest. Combine the flour, baking powder and salt. Add to butter mixture and combine well. Fold in the pine nuts and cranberries. Divide the dough in half. 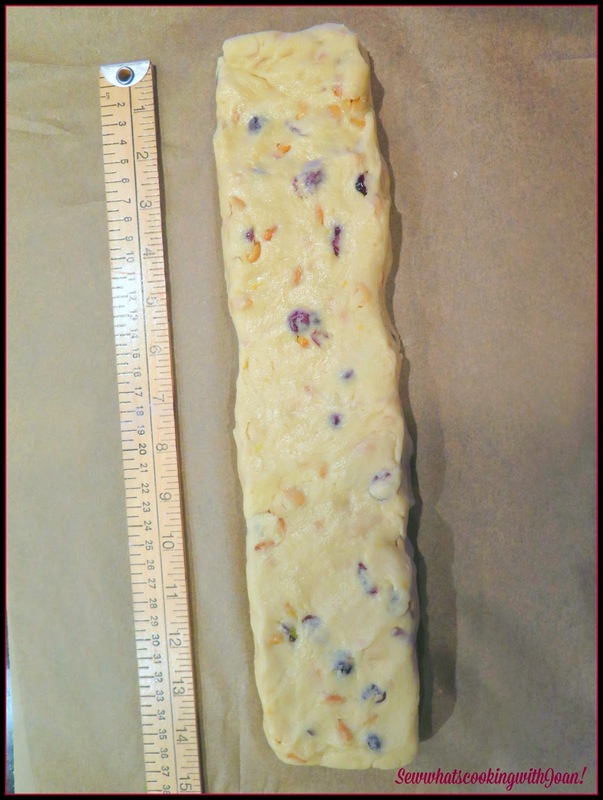 Form into two 14" long logs, about 1/2 inch high and 1 1/2 inch wide, bake for 25 minutes or until lightly golden. Remove to a tack and cool for 5 minutes. Place each log on a cutting board and slice diagonally into 1/2 inch slices. Use a serrated knife. Return slices to baking sheet and oven. Bake for 10-15 minutes, turning them over once. Cool on rack. Melt chocolate, drizzle over the biscotti. This delicious bit of perfection is also great for the cookie swap, only if you want to be the "Rock Star" of the swap! 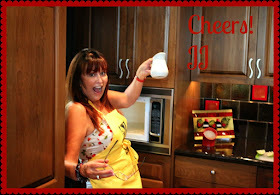 Who wouldn't want to receive a few biscotti to have with their morning cup of Jo? These delicious morsels of goodness are just as good without the white chocolate drizzle! I made these for a friend who is cutting back on sugar. Slipped into a clear cellophane bag, tied with a pretty ribbon, it's a perfect hostess gift too! you and your family a joyful Festive Season. Whether you will be staying home for the celebrations or traveling to distant places, may you enjoy the holiday festivities and welcome the New Year with health, happiness, peace and prosperity. 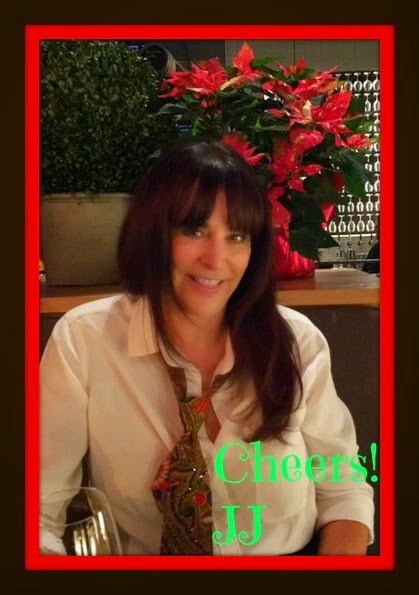 To my followers, numbering now, well over 100,000 on goggle, Facebook, Twitter and email, thank you for your valued support.